I’ve been hearing about this book for a while now, and planning to read it. I last read the Odyssey decades ago, mainly because I regarded it as part of my education. Whichever translation it was, it was okay but not inspiring. Finally, I got around to the Wilson translation. After reading the introduction of on my Kindle app, I switched to audio. This is actually the first audio book I’ve listened to, and it made a huge difference. Claire Danes did a great job of narrating it. It really felt like something I needed to hear rather than see, and some of the repetitiveness that might have been irksome in print was perfectly acceptable in audio. I was also struck by the social and moral code underlying the story, some of which was discussed in the introduction. King of Liars is an honorific. So is Sacker of Cities. Everything depends on the favor of the gods, but while their favor can be courted – mainly by animal sacrifices – it is not reliably given. The King is very much the boss, until he’s dethroned and someone else takes over. Today was the Wiscon kick-off with the guest of honor readings at the wonderful bookstore, Room of One’s Own. Unfortunately, Tananarive Due couldn’t be there because between her teaching schedule at UCLA and the flights from the West Coast, she’d need a time-turner. Saladin Ahmed was there, though, and gave a warm and self-deprecating introduction. Then he read a short story that was a comical yet moving play on the Indiana Jones trope. Here’s what I saw at our lovely local bookstore. It’s a new book by Rati Mehrotra, and I’m eager to read it. And in the same bookstore, there was Best American Science Fiction and Fantasy 2017… and I knew about half the authors. Including my Clarionmate, Nick Wolven. I am feeling very much in the middle of the writing world, and proud to know all these amazing people! The discussion started with genre silos – writing books that are strictly within a genre, vs cross pollination. Also: If you write in more than one genre, should you consider different pen names? Annie: It’s important for new writers to stay strictly within a genre, because of the way Amazon algorithms work. The most important element is the Recommendation engine, which will tend to recommend books similar to the ones a reader has already bought. The “also-boughts” are key: If people who bought your book also bought other books within the genre, then the also-boughts will give the correct signal. If you use the same name for two separate genres, you might get some cross-over readership – people who liked your Urban Fantasy may also enjoy your Adventure thriller series. But percentage-wise, most genres are separate readerships, and the result is the also-boughts get confused and give the wrong signals. So if you’re writing in two genres, at least use slightly different pen-names – like adding in an initial – to distinguish them. The Romance readers are more likely to cross into other genres than most other readerships. Series are good for self-publishers; if readers like one book in the series, they buy all the others. The best thing you can do for your sales is to publish the next book in the series. It gives a boost to all the previous books. How soon should you publish your next book? For traditionally published books – about one a year was the conventional wisdom. For self-published books, the ideal would be every 30 days (!) in the same series. If you can’t do 30, go for 60. If you can’t do 60, go for 90. If you’re a slower writer, then wait until you have at least 3 books in a series ready to go, and then release them once a month. This again comes from an Amazon algorithm. They have a 30-day “Hot New Release” list. If your next book comes out in time to get on the list *again* it will boost your series’ profile. They also have a 60-day list and a 90-day list. Writing fast is important. She said that when her pace of writing slowed, her income dropped every month. If you want to write faster, Annie recommends the book: “2k to 10k: Writing Faster, Writing Better, and Writing More of What You Love” by Rachel Aaron. What’s the difference between paper books and e-books? For much of the readership – they’re two different things. People who buy paper books don’t always read e-books. But people who read e-books often read paper as well. For a self-publisher, paper books aren’t worth the trouble. The pricing is hugely different – an e-book can be priced at 99 cents to maybe $7.99, while the paper book will be $15 or more. The margins are tiny. You don’t have the reach to get them into bookstores. That’s where the traditional publishers have a stranglehold on the channels. Annie said she makes more (per book) on a $3.99 e-book than on a $25 hardcover book. On Amazon, at any price above $2.99, you get to keep 60-70%. Annie sold the paper rights to her “20-sided Sorceress” books to Saga, an imprint of Simon and Schuster. They called her when her series took off on Amazon, and asked if she was interested in a deal. She crunched some numbers, and said it would require an advance of around $2 million. There was complete silence from the other side. Then after a few minutes, they asked about print-only rights. “That… would be a lot less,” Annie said. So she sold them the print rights (and, she says, immediately turned round and paid it to the Federal Government as tax! ), and took down the print version of her books. They were selling only a few copies anyway. The panel emphasized that unless you were writing as a hobby with marginal expenditures and earnings, you need to run it as a business. Annie recommended watching “Shark Tank” to get the flavor of it. Publishers are not employers. They can and will drop you and your books. You have to look after your own career. If you’re self-publishing, you have to find and hire and co-ordinate with editors and cover artists. It’s your book when you write it, but once you publish it, it’s a product. Like hamburger. You want people to love your hamburger. Put on your publisher hat . You can find a cover artist by looking at the covers you like, and contacting the artist. Or ask the author of the book who the artist is. Raven Oak does A/B splits to see which cover will work (for books from her micro-press). Back cover blurb: Keep it short, but long enough to convey the tone. It should capture the character, setting, tone, and stakes. Annie: A new book. It boosts the sales of all your books. Besides that, good covers. Third, mailing lists. Raven: Make friends with librarians, other contacts like Seattle Times, independent book sellers. Jak writes traditionally published books. Many have earned out. He also does freelance work for hire. What about audio? When is a good time to do an audio book? Someone (Raven? Jak?) said, ideal would be right away. Annie pointed out that making an audio book was expensive – it would cost $150 per hour or so just for a voice actor. She suggested waiting for Audible or one of its competitors to approach you. She has a audio contract with royalties. Definitely get an accountant. Very well worth it. Keep records meticulously, in real time. Record all your earning at the time in an Excel spreadsheet. The IRS recognizes income when it can reasonably be expected to arrive, not when you actually cash the check. A lot of expenses are deductible, including furnishings for a dedicated home office. Don’t expect a 1099 will arrive. You may have to track it down. You’re responsible. Is an LLC worth it? Probably not. It’s state level, not federal level. It doesn’t make a difference on taxes. It only protects against liability, but not against libel/ slander/ copyright infringement – the things of most interest to authors. If you get sued, you would be better off using the money to hire a lawyer. It’s only useful if you want to hire employees. If you’re big enough, you may want to form a corporation, but only when you’re really big. What about Conventions? And what promotional material do you use? Jak: I go to all affordable Cons within driving distance. For large Cons that are outside driving distance, I try to combine it with other stuff like visits to family. WorldCon is huge. I use business-card size cards of my book covers with contact information. Annie: I go to Cons to hang out, meet other writers, and help others. I go to local Cons and WorldCon. I don’t sell a lot of books at Cons. Tori: I go to local Cons, and now I’m the Track Lead at Norwescon. It’s for learning, meeting people. I carry business cards. Other forms of promotion? What about social media? Annie: Have a mailing list and a monthly newsletter. Doesn’t really promote her books on social media. Raven: I use Instagram. Pictures of our books photographed in interesting locations. It does boost sales. General suggestion: Pick the social media you already love. You may or may not get much of a sales boost from it, so don’t do it if you hate it. Big Pulp first published my story, Lepers, some years ago. That was for their online magazine. Now they’ve reprinted it in Big Pulp 2016, in a beautifully produced paperback edition. Event Horizon – Free and available until July 15, 2017! Proud to have a story in this collection! Jennifer Carson, Maya Bohnhoff, Anna Warren Cebrian, and Cliff Winnig put on a very practical panel at Convolution 2015 (Oct 2-4, Burlingame, CA) about book covers. These are more important than ever with so many books coming out of small presses or being self-published. The most important thing to bear in mind: The job of the cover is to sell the book. It has to attract attention, and give the right signals about its content. It doesn’t have to perfectly reflect any scene in the book, or even be completely true to the book. But it shouldn’t cheat the reader’s expectations – that just ends in bad reviews. If you’re writing genre fiction, the cover should reflect the right genre. This means the right color palette, the right image, and the right font for that genre. For instance, science fiction uses blues, black, green, red, orange and modern-looking fonts. A space ship on the cover is a clear signifier. Romance uses pinks and reds. 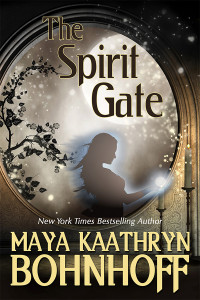 Urban fantasy uses darker colors and appropriate images. The best way to figure this out is to look at a hundred different covers in your genre, and see what they have in common. With online sales being large and growing, the image must work as a thumbnail. It should still tell the genre and the the title and author name should be clear. For print editions, the spines are extremely important – that’s what the reader will see on a bookshop shelf. Plan to wrap the colors and carry the right information. If you’re writing a series, the covers should indicate the series branding. The images and colors should be related, and a blurb should establish that it is a series, and which number book each one is. If it’s a print edition, the spine should say which number book of the series it is. Generally, a cover should have no more than three fonts, preferably in the same font family. It also should have not more than three image elements, and they need to work together. More becomes cluttered and confusing. People on the cover (faces, figures, whatever) draw the eye more than just scenery or objects. The font of the author’s name should be large, ideally as large as the title font. If it doesn’t all fit, make the surname the largest for print editions, since that’s what they’re shelved by. If you’re publishing the book in print, don’t make it an awkward size. It’ll get shelved separately and be harder to find. There are two parts to a cover – finding the art, and then designing it into a cover. For the art, you can use stock art; commission artwork; use photographs made by you or your friend and family; or bypass the whole thing and use premade covers. Photographs taken by you, friends or family can be useful. One panelist found her son’s photos from an Aquarium visit made great space photographs for science fiction covers. Commissioning a cover. You can either commission a complete cover, or get the artwork made separately and then design it into a cover. With the internet, prices have plummeted because excellent artists from Asia and Eastern Europe are willing to work for relatively low prices and send a good digital file that can be converted to a cover. (Deviant Art is one source.) However, these artists are not necessarily book designers, and you may need to do that or hire someone to do it. Prices are vary between $250 and $2000, but a good professional cover is typically around $500-800. Artists who will work with existing art and design the cover typically charge around $50/ hour. Online sites (like this one) offer cover design for far less. Premade covers. An increasing number of sites offer pre-made covers, where you scroll through until you find one that would work for your story. In some cases, they are one-offs and so you have an exclusive; others will offer the same cover for sale multiple times. It’s worth doing an image search to see what else that cover is associated with. Sites mentioned at the panel: Safari Heat Book Tours and Author Services (offers exclusivity, and will tweak the covers for an extra charge); HowardDavidJohnson (not exclusive unless you pay extra); and one other I couldn’t find. These looked a good bit cheaper than the prices discussed, but perhaps there are charges I didn’t look at. There was discussion of the white-washing of Octavia Butler’s first book covers. The original cover was pretty good at selling the book, but, as Cliff Winnig pointed out, it will live in infamy. The picture was of a white woman while the book’s characters were dark-skinned. The marketing department decided that it would sell better than way. It may even have been true, for two reasons. First, readers’ biases. Second, the book might get shelved with ethnic books (bookstores’ biases), and not reach its science-fiction audience. However, this practice contributes to erasure and the impression that the reading audience is all white. Publishers are learning not to do it. If your book is not self-published but going to a publisher, you may not get a say in the cover. They may make the decisions without any input from you at all. This too is gradually changing, as self-publishing and small indie presses change authors’ perceptions of how much control they should have. Even the large presses are beginning to listen. If you hate the cover they’ve designed it may be worthwhile telling them; in some cases, they are willing to change it. Small presses are usually more accommodating than large ones. Kater Cheek, my friend and Clarion-mate, has several novels and stories for sale on Amazon. She’s put her short stories out out as ‘doubles’ – two short stories per download. Recently I bought “The Third Pig” & “Sleeps with the Fishes” for my Kindle. I always enjoy Kater’s work, but these two might just be my favorites among her short stories. They’re both clever, funny, and wonderfully satirical. …and then Al and Fritz disappear. Now it’s up to Hans to unravel the mystery and decide just how far he can trust Conn. If you like fairytales retold and updated as light-hearted satires – check this out. I can’t decide which the best bits are, there are too many good ones. (It would be perfect for a drinking game, catching allusions to fairy tales and nursery rhymes.) The reference to “Sty” magazine (Al’s inspiration); the bar scene with Elsie the sheep and a couple of others, where the party gets a little wooly and she gets three sheep to the wind and they’re all talking about a touring band from Bremen; or Rosie, who has the misfortune to help a witch and now gold coins fall from her mouth when she talks, so she has to use a chalkboard to communicate; or when Hans describes the filthy conditions at the Seven Dwarves’ cottage and adds, “bear in mind it’s a pig that’s telling you this”. It’s a hoot with heart. And when the said mermaid – who is your college classmate Ashlee, transformed just at the most inappropriate moment – starts to drown on dry land, you have to do something. You can get her head into a trashcan full of water – but now the water’s getting stale. She needs to be in the ocean. If you’re in the mood for something light-hearted, try these two stories. I read Little Brother soon after it came out. I’d heard Cory read from it during Clarion before it was published, and found it both exhilarating and shocking. It was still the Bush era, and my first reaction was, Have you talked to your lawyer? Well, the book came out and it was a hit. 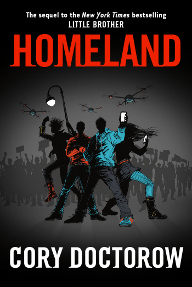 Homeland is the sequel, and somehow I just got around to reading it. I don’t know why I waited. I loved it. So M1k3y is back under his real name, Marcus, and he’s fighting again. When an old friend hands him a dangerous USB that will allow him to access over 800,000 damaging documents about government and corporate wrong-doing, he’s got to decide how to handle it. The ethical and practical dilemmas that result drive the story. The book opens at Burning Man, and that grabbed my attention. I’ve always wanted to go to Burning Man, but given the logistics and conditions on the playa, it’s increasingly unlikely that I ever will. This took me there with clarity and atmosphere. The book seemed to introduce a cool new tech every chapter, in a way quite accessible to non-techies. It took every new technology or idea I’ve found intriguing – from 3-D printing to quadricopters to People’s mic – and wove them into the plot. Though this isn’t really a character-driven novel, I felt I’d got to know Marcus and the others well enough to be involved with them. And I found the plot gripping, leaving me wondering what I’d do in his place. The book is intensely political, in the same way as 1984 is political. If you think Edward Snowden is a hero, you’ll probably enjoy it. If you think he’s a thief and a scumbag, the political values will probably make it unreadable. 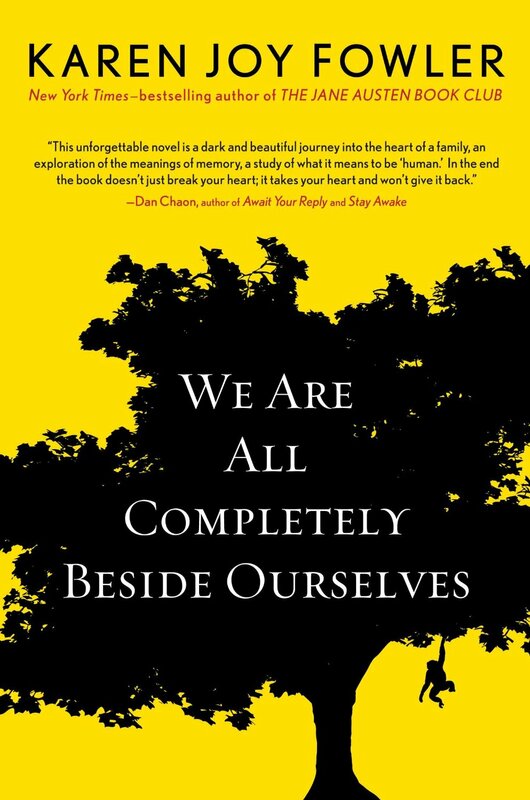 Just finished reading Karen Joy Fowlers “We are all completely beside ourselves.” Coming up for air now. It’s a masterpiece. The voice is comic, sprightly, delightful. The story is dark and layered… so much so that midway, I thought it might be too much for me to deal with. I’m glad I continued. I lucked out on the way I came to this book. At Wiscon, where Karen read from it, I’d hoped to get her to sign it for me. I didn’t know anything about it then, but Karen was one of my Clarion instructors and I love her writing. But the book wasn’t actually coming out until two days after Wiscon. Nor could I attend any of her Bay Area signings, where I’d undoubtedly have bought it. I’d wait, I thought. This is San Francisco, she lives not too far from this city, and would undoubtedly be here for a reading some time. But before that happened, my author friend Kater Cheek wrote a review that made me feel I couldn’t put it off any longer. The rest of her review was general – as this piece will be, and for the same reason. There’s a surprise that hits you well into the book that makes everything you’ve read thus far fall into place. If you know what that surprise is (and I think many people do by now), it’s still a superb book, but it loses – that. So anyway, after reading Kater’s review, the Kindle edition of the book was only a couple of clicks away. And that’s where I got lucky. The paper version of the book actually has the surprise on its dustjacket. (I still haven’t bought the paper version, though I intend to do so the next time Karen can sign it.) In fact, it’s even in the description on Amazon, which thankfully I did not read. So when I started in, the revelation burst upon me as the author intended, with just the right mixture of shock and comprehension and satisfaction of curiosity and revising of mental images. And that’s why this isn’t really a review of the book, but more of a reaction to it. I would have read the book for the voice alone. The protagonist, Rosemary, is a college student when we first encounter her. She’s just been arrested for getting involved in a cafeteria incident where the girl at the next table is breaking up with her boyfriend by breaking things. Her descriptions are smart and witty, the turns of phrase utterly wonderful. But it gets even better. It’s not just the voice, it’s about reality. And perhaps the motto of this book should be ‘Nothing is as it seems.’ There’s a deeper meaning to everything, and even that keeps changing. The plot twists like a snake in a maze. And it gets worse, especially if you take families, love, and animals seriously (and all these matter to me). Difficult political themes emerge, confronting us with the whole issue of the homo sapiens and its relation to other animals – including power, love and cruelty and confronting Rosemary with a confusing set of choices. The story inexorably darkens. As I wrote in my immediate reaction, at one point it was getting so depressing – despite the witty tone – I thought I might stop reading. But I didn’t. And it gets better again, pulling all the disparate strands into a bitter-sweet ending that was a lot more satisfying than the fashionable grimdark things where life slides into an inevitable decline and a book’s beginning is the best part of it. The technical virtuosity is breathtaking, leaving me-the-writer undecided whether I should tip my hat and bow profoundly, or dig a deep hole and pull the turf over me in despair. Also – she makes it looks easy.